Slow or difficult program upload? Restore your machine to reliable, production status. Even the highest quality products become outdated over time. Reliability suffers and production needs increase. A new Centroid CNC control can provide your high quality Fanuc CNC machine with the performance and reliability of a brand new machine for far less expense. 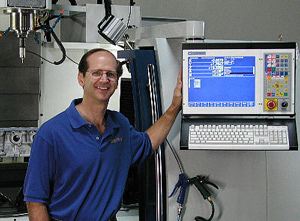 With all new state of the art electronics your Centroid powered CNC machine will not be calling in sick. Simpler part programming, faster program file transfer, easier to read display, Operator prompts in plain text, many one button features like software backup and much more. Built in conversational part programming provides "fill in the blank" ease. High speed files transfer from USB or Ethernet. 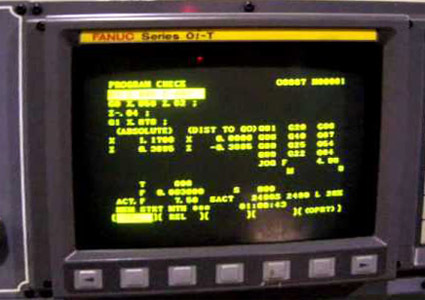 Processes standard Fanuc G-code programs. Open a standard text editor right at the machine console for any last minute changes. Files are stored on the control. With Gigabytes of storage capacity your control can accept and store new programs for many years without ever running short on storage capacity. Are you currently splitting up your part programs due to small memory size? Centroid CNC controls provide 4 Megabytes of program file size as standard and UNLIMITED file size is an available option. Time per part is displayed on screen, parts per hour and other statistics are readily available. Centroid CNC controls can work with any black cap or yellow cap motors. Red cap motors may or may not be compatible. Retaining your current servo motors will save you a substantial amount. Contact Machines in Motion, Inc. for details. Higher speeds & faster acceleration. Upgrading your servo system with Yaskawa servo products will provide maximum machine performance and a long, trouble free life. When quoting a complete control upgrade Machines in Motion, Inc. will include everything needed to put your machine back in production. This includes any custom PLC programming, Motor adaptors, Console mounts, and Wiring. We even provide on-site control use training to kick start your part production. Frequently we are asked to provide optional features aimed at shortening the operators time per part. Touch probe for quickly locating a part or fixture home point. Tool touch off will automatically install the length offset of each tool. Digitizing can copy the geometry of a solid part while generating the G-code program to cut that new part. along with other custom features. We can make your machine function the way you always wanted. These are the highlights but there are many other good reasons to upgrade your machine. Contact us with any questions you may have. All emails are responded to with in 24 hours. Phone calls are answered by a live person who is ready to provide the answers you need to evaluate your upgrade project. Professional level controls with money making features that speed your work from programming through setup and the cutting of your parts.